Wow, what a fun day of family gaming we had on Saturday. We played six different games and one of them twice, including a game we had not played before. The first game we played was Coloretto. We didn’t play this game at all in 2006, and this was our first play in 2007. I’ve expanded the game so 7 can play, and it is as much fun with a large group as with a smaller one. We play three games and total the scores to count as one game on our family records. Katrina scored big in the first game, and we couldn’t catch her during the next two. Results: Katrina first (53 points); Dan second (47); Sue third (46); Mason fourth (44); me fifth (43); Joel sixth (40); Kassi last (27), only her second time to play this. Next up was a new game I’ve been wanting to play – Drakon 3rd Edition. This is a neat game. Although designed for a maximum of 6 players, we tried it with 7, and it worked fine. I need to find another character (Hero) token, and I don’t like the fact that all the characters are the same color. I may try to find 7 painted miniatures, or I’ll paint the bases of these tokens, to help differentiate them. 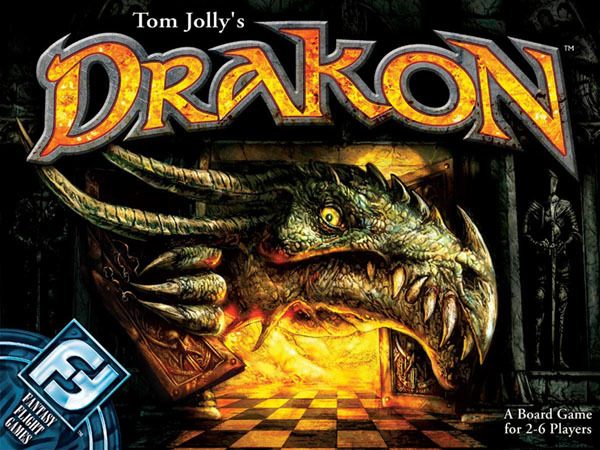 We played only with the basic rules, plus we agreed that Drakon could not be moved to the starting chamber. That didn’t turn out to be a problem, because the game ended so quickly that Drakon was never in the game. We had 4 chambers placed very early that allowed us to draw gold coins, plus a teleport chamber that allowed us to re-enter the treasure chambers repeatedly. The game was over quickly. I drew only four coins to win the game – 2 threes and 2 twos. Results: Me first (10 gold); Kassi and Sue (tied) second (9); Katrina and Mason (tied) fourth (6); Joel and Dan (tied) last (5). We expect to play this some more. The third game of the day was Around the World in 80 Days. I really like this game. Sometimes I win and sometimes I don’t even finish. This was one of those latter days. Mason was unbelievable in this game. He moved to a new city every turn and finished well ahead of the rest of us, and used only 68 days to do so. We were amazed. We were further amazed when Joel also finished at 68 days, only two turns after Mason. That means Joel did even better with his time, since he also had penalty days added, after Mason got to London. Katrina and Sue also tied at 76 days, with Katrina finishing just ahead of Sue. Dan hit 80 days exactly, while Kassi ran to 84 days. I was holding three train cards when Kassi finished, but I needed one train and two ships, so I could not finish. If I had had enough ships, I was in a position to actually finish in fewer days than Mason and Joel, but it does no good if you don’t have the cards to finish the game. Results: Mason first; Joel second; Katrina third; Sue fourth; Dan fifth (although he was the second to reach London); Kassi sixth; me last (did not finish). Next, we played two games of Pickomino. This is a neat, easy, quick game, even with 7 and 8 players. Natalia decided to join us for the second game. Worms were not too difficult to obtain in the first game, but we had terrible dice rolls in the second. Results of game 1: Sue first (8 worms); Joel second (4); Dan and me (tied) third (3); Katrina fifth (1); Mason and Kassi (tied) last (zero worms). Results of game 2: Me first (4 worms); a 5-way tie for second – Dan, Katrina, Mason, Natalia, Sue (3 worms); Joel and Kassi (tied) last (zero worms). Poor Kassi ended with no worms in either game, although she acquired them along the way, but had them stolen or lost them with bad dice rolls. We thought we could entice Natalia to play Trumpet with us, but she declined. This was a fairly long-playing game, for some reason. With 7 players, it is difficult to catch more than a trick or two in one hand, and sometimes it’s easy to go several hands without catching any tricks. Joel had mostly bad hands of cards, and he had a tough time. Once the rest of us left him behind, it was almost impossible for him to catch up, since he had no tokens to jump over. The game came down to the wire, with Kassi on the next-to-last space and Katrina one space behind her. I was about three spaces behind Katrina. Kassi thought she had won, when she was able to play a trumpet card, but Joel played a trumpet card to beat her. On the next play, Katrina played the winning card. Results: Katrina first; Kassi second; me third; Dan fourth; Mason fifth; Sue sixth; Joel last. We also thought we might get Natalia to play Bohnanza, but she just wasn’t in the mood for games. We all enjoy this game very much, with fast and loud trading going on constantly. Kassi won with a good margin, for this game. Results: Kassi first (13); Dan and Katrina (tied) second (10); me fourth (9); Sue and Joel (tied) fifth (8); Mason last (7). We certainly enjoy our weekly family gaming. We still have Ave Caesar and Silk Road to try out, but I’m not sure when we will get to them. I was glad to see Drakon go over well. This was my week to choose games, and I had “threatened” to only get out unplayed games, but I knew that would not be very popular, so I only brought out Drakon in that category. Everyone was glad to see old favorites on the table, with Drakon. It is a little difficult to believe that we didn’t play either Settlers of Catan or one of the Carcassonne games this weekend (but, I wanted to play other games, so I didn’t get them out). I’m sure Settlers will be on the table next weekend, because Mason and Kassi are selecting the games.